Finding Dory Now In Stores & CONTEST (CANADA)! If you're looking for a great kid gift for the holidays, Disney's Finding Dory is now on blu-ray and DVD! 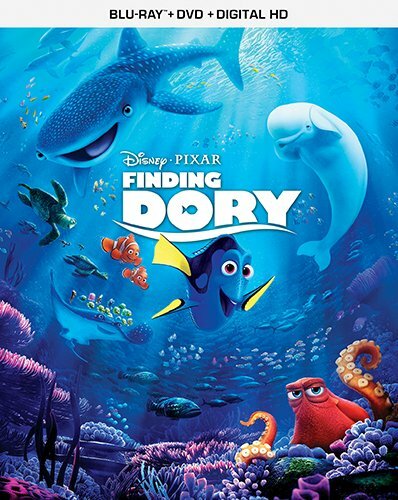 Finding Dory is the sequel to Disney's 2003 blockbuster Finding Nemo. Although the storylines are similar, it definitely reimagines the story for a brand new audience. Finding Dory is a comedy about a fish suffering from amnesia, that goes on a quest to find her lost family. Dory, voiced by Ellen Degeneres, is entertaining for audiences both young and old. My family also loved Hank the stealth-mode octopus, voiced by Ed O'Neill (Al Bundy from sitcom Married With Children). We'd definitely recommend Finding Dory for family movie night. WIN a copy of Disney's Finding Dory on blu-ray/DVD from SnyMed.com! Contest open to Canada (sorry USA!) and ends on Thursday December 8th, 2016. Leave a COMMENT below stating if you've ever watched Finding Nemo or Finding Dory and if so, what you thought of the movie(s). Then, use the entry form below to enter the contest. GOOD LUCK! I have not seem either movie. Would love to win to watch with my niece. I have seen both movies, love both of them. I have watched Finding Nemo with my little grandson and thought it was very cute. I have seen Finding Nemo but not Finding Dory! I loved Finding Nemo and I can't wait to see Finding Dory. My kids would be thrilled if I won a copy. I loved Finding Nemo but haven't gotten to see Finding Dory yet. It's on my wish list with the grand kids. I have only seen Finding Nemo so far but loved it. I have seen Finding Nemo and loved it. Have a copy at home. Want to see Finding Dory. I have seen Finding Nemo and it was a great movie for all ages. Loved Finding Nemo! My girls have seen Finding Dory but we haven't! Would make a perfect gift!! Haven't watched Finding Dory yet but have watched Finding Nemo. We have not seen Finding Dory but have seen Finding Nemo. We liked Finding Nemo and if that is any indication of what Finding Dory is like I'm sure we will enjoy the Dory movie. I have seen both movies, loved them both! I've seen both and loved both. Great movies! We've seen Finding Nemo and love it, but we have not seen Finding Dory yet - would really love to!! I have seen Finding Nemo and it was such a good movie. I haven't seen Finding Dory yet. We saw the movie in the theatre. My DD10 had a Finding Dory 10th birthday party. We have seen Finding Nemo but have not seen Finding Dory yet. I have not seen Finding Dory yet but I have Finding Nemo on DVD. I have watched both and I preferred watching finding dory better. I have seen Finding Nemo and it was cute. I have not seen Finding Dory yet. We love Finding Nemo, but have yet to see Finding Dory! I have seen Finding Nemo but I have not seen Finding Dory. I have watched Finding Dory and I loved it. My little guys and I have watched Finding Nemo and would love to see Finding Dory. Thanks so much and happy holidays! I love Finding Nemo and can't wait to watch Dory. Loved both of them and even watched Finding Dory at the theatre with my kids. Loved it! i have seen finding nemo, but i havent seen finding dory yet. I loved finding nemo, so im sure i will love finding dory. Finding nemo was quite good, im sure this one will be a hit for the kids. I still haven't seen this yet. It would be a great movie with my grandson. My boys LOVE Finding Dory. I went to the premiere with him.